The internet is kinda big. Consider, if you will, all that happens each and every minute online. Every 60 seconds 433,000 tweets are sent on Twitter. That’s up from 347,000 tweets per minute just a year ago. Year-on-year, Facebook logins have jumped from 461,805 to 600,000 per minute. Almost twice as many photos are uploaded to Instagram, and close to three times as much YouTube content is uploaded – from 103 hours per minute to 306. 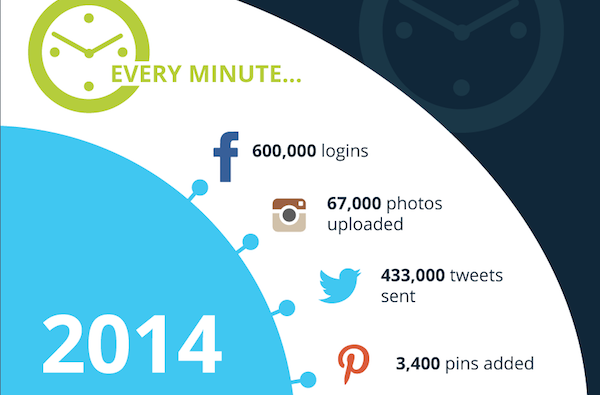 Check the visual below for more 2013 vs 2014 internet minute highlights, which comes courtesy of TechSpartan.co.uk.